Former Kyrgyz Prime Minister Sapar Isakov faces up to 20 years in prison if a court in the Kyrgyz capital finds him guilty of corruption. The former mayor of Bishkek, Kubanychbek Kulmatov, also faces 20 years on similar charges. Kulmatov and Isakov were arrested in May and June 2018, respectively, and imprisoned while the government investigated charges of corruption relating to a 2013 financial aid package from China, which included the modernization of the Bishkek Heating and Power Plant. The plant produces not only electricity but pumps out heated water into Bishkek homes. According to local media, Friday night [January 26, 2018] some equipment at the Bishkek Heating and Power Plant failed, leading to a decrease in electrical output and lowering water temperatures. For some in Bishkek this meant lukewarm radiators and for others, a blackout which cut electric heating sources like generators. The plant had been modernized, to much fanfare, under a Chinese financial aid package given in the opening overture of what is now called the Belt and Road Initiative (BRI) in 2013. Work was completed in August 2017. The early 2018 failure just five months later ginned up a firestorm of anger and corruption accusations. A loan agreement between China’s Export-Import Bank and the Kyrgyz government in 2013 paved the way for a Chinese company, Tebian Electric Apparatus Stock Co. Ltd. (TBEA), to win the contract to modernize the plant for $386 million. Work began in 2014 on modernizing the 1960s-era Soviet-built facility. When the contract was awarded, Isakov was deputy head of the presidential administration and spearheading work on foreign investments. When he was arrested, the State Committee for National Security (SCNS, GKNB, or UKMK) accused Isakov of lobbying for the interests of TBEA. Kulmatov, who was mayor of Bishkek at the time, has been accused of redirecting $2 million in Chinese grants given in 2013 as part of the larger aid package. 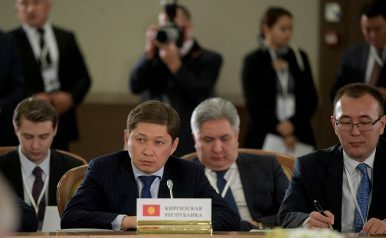 Isakov then served as prime minister from August 2017 to April 2018, when he was dismissed by new Kyrgyz President Sooronbay Jeenbekov. Kulmatov, who had most recently held the top spot in the customs service, was similarly dismissed ahead of being arrested. This entire saga is underscored by the no-longer-subtle tension between Jeenbekov and his predecessor, Almazbek Atambayev. What began as dismissals and shuffling of Atambayev allies in the new government has moved into open rhetorical warfare and accusations of corruption. Ironically, Jeenbekov was Atambayev’s personal pick for a successor. But their split may rupture the Social Democratic Party (SDPK), to which both men belong and which currently holds the most seats in the Kyrgyz parliament and tops the ruling coalition. Atambayev, for his part, has denounced the leveling of corruption charges against his former colleagues and political allies as a “witch hunt.” In June 2018, the former Kyrgyz president, in typical style, fired off against his successor. “Under a motto of the fight against corruption, in fact, ‘the hunt for witches’ has begun,” he said. As the judicial process moves forward, both sides will harden their positions: In Jeenbekov’s case, that the filing of charges is merely a pursuit of justice against the corrupt; and in Atambayev’s, that these cases are little more than political persecution. Meanwhile, although China and its aid, loan, and business practices would seem to be a central part of this saga, the furor has barely touched the bilateral relationship. This perhaps says more about the mammoth presence of China in Central Asia and the lack of flexibility any Kyrgyz leader has when facing Beijing than it does about either the Atambayev or Jeenbekov administrations.